هوروث، ریچ (۲۰۱۴). اوج‏ گیری: قواعد سه‏ گانه تفکر استراتژیک پیشرفته. ترجمه: نادر سیدکلالی و بابک وطن ‏دوست (۱۳۹۳). 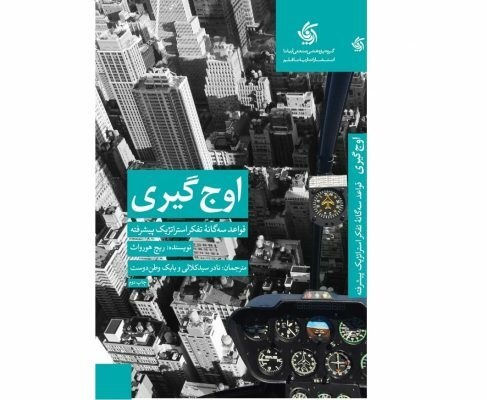 تهران: انتشارات آریاناقلم. Zareie Matin, H., Seyed Kalali, N., & Akhavan Anvari, M. (2012). Do Demographic Variables Moderate the Relationship between Job Burnout and Its Consequences? Iranian Journal of Management Studies (IJMS) 5 (1):47-62. Momeni, M., Seyed Kalali, N., Akhavan Anvari, M., Raoofi, Z., & Zarrineh, A. (2011). What Kind of People Are the Happiest? An Empirical Study. International Review of Business Research Papers 7 (3):42-54. Akhavan Anvari, M., Seyed Kalali, N., & Gholipour, A. (2011). How does Personality Affect Job Burnout? International Journal of Trade, Economics and Finance 2 (2):115-119. حیدری، علی و سیدکلالی، نادر. ارائه مدل مزیت رقابتی شرکت‏ های مشاوره مدیریت براساس نظریه قابلیت‏ های پویا، فصلنامه علمی پژوهشی مدیریت بازرگانی دانشگاه تهران. کریمی دستجردی، داوود. پورعزت، علی ‏اصغر. سیدکلالی، نادر و اخوان انوری، محمدرضا. (۱۳۸۹). رتبه بندی موانع پیاده سازی تصمیمات راهبردی. فصلنامه مطالعات مدیریت راهبردی دانشگاه شهیدبهشتی. ۲: ۴۹-۳۱ . Seyed Kalali, N. (2015). A Fuzzy Inference System for Supporting the Retention Strategies of Human Capital. 11th International Strategic Management Conference, at Austria, Vienna. Gholipour, A., Akhavan Anvari, M., Seyed Kalali, N., & Yazdani, H. (2011). Investigation of the Effects of the Big Five Personality Model on Job Burnout (Survey in an Iranian Hospital). International Conference on Economics and Finance Research (ICEFR), at Singapore. Momeni, M., Akhavan Anvari, A., Seyed Kalali, N., Raoofi, Z., & Zarrrineh, A. (2011). The Effect of Personality on Happiness: A Study in the University of Tehran. Paper Presented at Business and Social Science Research Conference, at UAE, Dubai (Oral Presentation).